Every year, I’m shocked at how little attention nutrition gets in the campaigns for cancer prevention and treatment. It wasn’t that long ago that a cancer diagnosis was a death sentence. Thankfully today, the trend is survival. But the main message to the more than 11 million cancer survivors continues to be watch and wait. I wanted to change that, so I teamed up with my father, a cancer physician for more than 25 years, to write a book that would guide cancer survivors to use their diet and lifestyle to get healthy and remain cancer free. The future of healthcare in our country has to be prevention and it’s time to learn what foods, drinks, and habits will keep us healthy and use less medicine. The traditional medical community is slowly warming up to this message. Places like the Cancer Treatment Centers of America (CTCA) assign an integrative approach to fighting cancer. Along with traditional tools like surgery, radiation and chemotherapy, they also employ nutritional support, naturopathic medicine, mind-body medicine and spiritual support. Their motto for cancer survivors is, “Celebrate Life.” Each year they plant a tree in honor of every CTCA cancer patient who has reached the five-year mark since they began treatment. 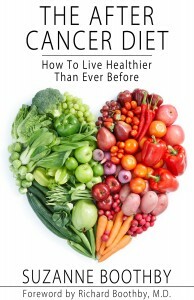 In my book, The After Cancer Diet, I teach simple steps to getting healthier. Readers will learn how to eat real food, find more sweetness in life (and less in food), develop a regular exercise routine, detox the body and lead a happier life with more creativity and joy. The book also includes recipes for healthy mocktails—festive cocktails without alcohol—and discusses research that links yoga to significant improvements in sleep, quality of life and stress reduction for cancer survivors.